Wallabies scrum-half Will Genia has further clouded Michael Cheika's most uncertain selection area for the Rugby World Cup with a fine effort off the bench in the 47-10 win over the United States. 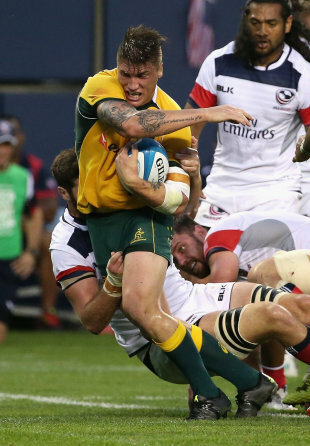 Playing his first Test since in over six weeks, the veteran half-back helped drive the Wallabies away from their gallant hosts with an assured passing display and a few trademark snipes. Genia replaced Nick Phipps - the only other specialist half-back in Cheika's World Cup squad - five minutes after the resumption and did more than enough to suggest the coach's biggest headache for the Fiji clash now lies solely at No.9, with Bernard Foley set to be the likely starter at No.10 after a fine display against the Eagles, including six conversions from seven attempts. "I just went out there and did my job," Genia said. "It was just about getting in there, looking to move the ball as quickly as I can and, you know, Cheik's really good; he just said 'go out there and obviously get your ruck work as far as moving the ball, but also bring what you bring and have a little bit of a nibble here and there'. And, as I said, I was just going out there to do my job for the team." Genia revealed the surgery on his knee had helped clear up a number of problems but admitted to being a little sore following the physical contest at Soldier Field in Chicago. "Yeah really good, I was just excited, really looking forward, to getting back out there and playing footy, I think the surgery on my knee fixed up a lot of niggling injuries and issues that have been sort of hanging around for a while," he said. "So body felt really good and, as I said, just really happy to get back out and play rugby. "Yeah it's (knee) sore, it's like stiff, it's a bit sore. I'll get treatment but I mean this was my sixth week and it was a four to six week injury, and this was the sixth week of the injury. So I really pushed to make sure I was back for this game and really happy; so we'll recover and it will be good." While Genia seemed to add direction and certainty to the Wallabies' attack after the break, Phipps also drew praise from Cheika. The Waratahs scrum-half had a forgettable night in the Bledisloe win over the All Blacks in Sydney and while one pass found the turf in Chicago, his combination with Foley was greatly improved from the ANZ Stadium encounter; the No.9 also backing up to score the game's second try. Phipps' long-time combination with Foley may yet still see him get the nod for the clash with Fiji at Cardiff's Millennium Stadium, but Genia said he too was more than comfortable playing inside the Waratahs No.10. "It's one of those things, you train so much together that you're going to get comfortable with guys inside and outside you," he said. "So it doesn't really matter as far as playing with Quade or Foles (Foley), I think they're both great 10s and bring different things to the game. It's more a communication thing, if they're nice and loud, nice and clear, you're going to know where they are, you're going to know how they want the ball and, as I said, you train so much together that you develop those combinations anyway."